It is imperative that a church should reach out to the community so we do not apologise for believing that we wish that all should become aware of the friendship and love offered to all by our Lord Jesus Christ. We pray that we might reflect His love by the way we live. 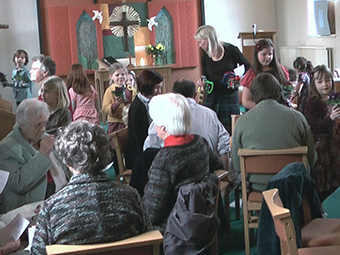 An important part of our witness is by trying to serve the community and encouraging organisations to use our church premises so that we may be involved in our village life. We are very pleased that our church is being used by a number of organisations. The group which is the longest to regularly meet in the church is Sandleheath Band which began in the Church as Sandleheath Methodist Band. It started when the late Don Marlow was asked to train a group of four young musicians to play at a Christmas Carol Service. From this humble beginning we have now a Brass Band which is widely acclaimed, have won many contests and under its musical director, Lynda Bird, performs for charity all around the area. 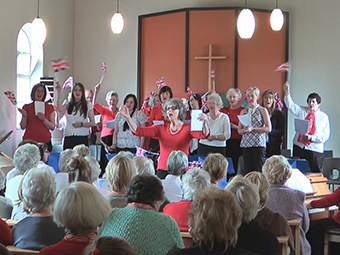 Also meeting on a Monday is the United Voices choir which is trained and directed by Gill Scott. This started when some mothers who attend church began to say “Why can’t we have a choir”. They worked it out with one of our organists, Sylvia Charlesworth. and now they bring their children from school at 4.00pm where Ann Roome and a group of helpers entertain and engage them in activities. Meanwhile the mothers and others have a choir practice in the Church. It isn’t a church choir in the normal sense and it sings a wide range of music but it does sing at Church for special events and has raised money for charity. Coffee Morning on thet1st Tuesday of each month. This is an opportunity for folk to meet together have a cup of tea or coffee and chat and also to raise money for our Church Funds. It has proved to be a popular event for the village . New people to the village come and soon are known and feel that they belong. The Bridge Club (led by Ray Rickman) meet. This is greatly appreciated by a group of people from a wide area who enjoy the challenge, stimulation, and friendship which playing Bridge can endue. Knit and Natter meet on the last Thursday of each month. It is not only a friendly social evening but ladies knit, sew and crochet. This can be knitting squares to make blankets which are donated to needy causes or it can be knitting baby toys and clothes or specific items for a particular need. Sandleheath has a strong Womens Institute group who meet in our church on the second Thursday of each month. They are very active and are involved in the district and national projects.. A lively and interesting series of speakers is arranged through out the year. Other groups and individuals use the church from time to time. Sometimes for birthday parties or business meetings and the hall is used as a Polling Station for local and National Elections.